This Beautiful Mantra has been given to us by Guru Nanak Dev Ji. This chant destroys the Ego and allows us to embrace the divinity inside us. Allows us to let go and surrender to the will of the creator. Jor na mangaṇ ḏeṇ na jor. 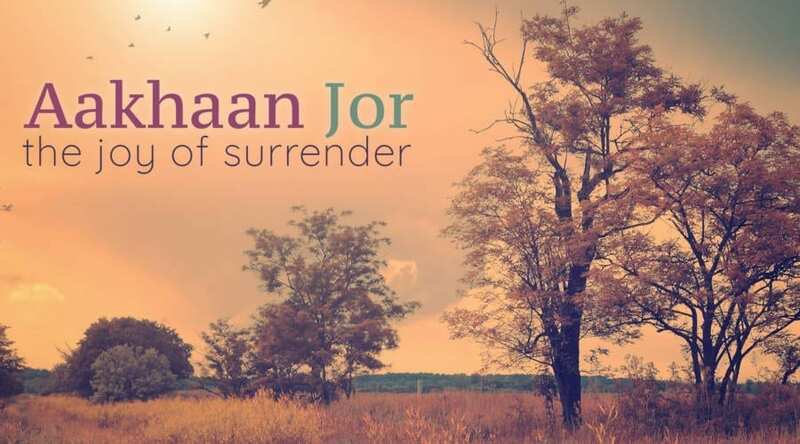 Jor na jīvaṇ maraṇ nah jor. Jor na rāj māl man sor. Jor na surṯī gi▫ān vīcẖār. Jor na jugṯī cẖẖutai sansār. Jis hath jor kar vekẖai soe. Nānak uṯam nīcẖ na koe. Ego_ ‘Self’ or simply ‘I’-the assertion of our False Self ;I say assertion because it being not our real, natural & essential self, has to assert itself; It tries to dominate over our Essential Self. This False Self of us has to do with possessions, the work we do, social status and recognition, knowledge and education, physical appearance, special abilities, relationships, person and family, belief systems, racial, religious, and other identifications. None of these is “Real Us.” We see everybody & everything through the flaws of our own egos. That is the way we all see each other in life. Arrogance, False pride, fear, desire, expectations,comparison,competition— all such distortions within our own egos– condition our vision. If my Ego is satisfied ,I am happy; if not,I get angry. Then there is a fight between my ‘I’ & your ‘I’ & the consequences you see in the world around- these bloodsheds,Wars,communal riots.broken families are all the result of Ego-clashes—-See how cloudy the glass has become through which we look at each other. Now this is not the the Essence of our creation_ rather the Creator created us in his own image with all those attributes like Love ,Truth,Humility,Empathy.But we are caught in the trap of worldly glamour & maya-we feel attached to the visible but false & temporary things may it be beauty,power,wealth or even relationships& have forgotten the Invisible, Eternal ,Real & Subtle Self of us. People get offensive if the relatives or friends don’t send their likes on Facebook,or don’t reply to what’s app messages_a lot of invaluable time,energy & money is being spent on what ‘I’ wear,how do ‘I’ look,what gift should ‘I’ give to my friend or relative to prove that ‘I’ love him/her.We try to show that we are loving, we are respectable;but in doing so we fail to notice that we are only decorating our Ego in gift wrap of other’s Ego;we are just trying to satisfy our & others’ ego. We are always conscious about what others say or think about us.Actually,we must understand that the moment we become self-conscious,means that we are not conscious at all & we have not started our journey Home. We must stop,reflect & regain our Consciousness, our Power, our Real Essential Self-our Paradise Lost.